Finding the right terminal in an airport you have only been to once before in your life is difficult, especially if there are no signs leading you. When I first arrived at the Los Angeles International Airport, I was lost. I knew I had to go to the John Bradley Terminal to find someone with an EF-sign to pick me up. This happened to be quite difficult because I could not manage to figure out where exactly at the airport I was. I had just left the airplane and started my first journey all alone. But, as soon as I left the immigration station behind me, I had no idea where to go. I was able to find a customers service desk and the friendly woman there told me that I was actually at the right terminal. I wanted to thank her and look for my transfer, but the woman was faster and started to page them. When she finished, she immediately called the emergency number, without waiting for the transfer to react. I told her that I had only been there for a couple minutes, but she had already started calling. As soon as they picked up the phone I saw a young woman with a pink EF-sign walking towards us. I told the woman at the customers service desk that I could see the EF transfer person and thanked the woman at the desk for helping me. The young woman with the EF-sign told me to wait there until another student arrived. She came back about half an hour later with a Japanese girl. Before we were able to start driving to Santa Barbara, our driver had to fill up the car with gas. The driver told me that it was her first time using this car. Unfortunately, she had no idea how to gas up. First, she picked the wrong side and had to re park the car. After she had tried for 10 minutes to fill up the car, she looked for help. Two employees came and tried to help her, but no one seemed to be able to solve the problem. About an hour after we had left the airport, we were still at a filling station near the airport, but somehow they managed to fill up the car. And finally, we were able to start our drive from Los Angeles to Santa Barbara. We drove for about two hours and first I talked to the Japanese girl, but then I was too tired and hungry. I tried to sleep in the car because on my twelve hours flight I had not slept very much. Half an hour before we arrived I had to call my host family. The father picked up the phone and seemed to be very friendly. When we arrived in Santa Barbara, the driver accompanied me to the door. When I first entered my new home, the father of my host family welcomed me and gave me something to eat. Shortly after, my new roommate came downstairs. She introduced herself and told me that this was going to be the best time in my life. I was also introduced to the other two EF-students living in the same house. I was too tired to remember all of these new names afterwards. As soon as my head started hurting, the mother returned with her five year old son. He is really cute, but also very loud. He hugged me and asked if I wanted some candy. I thanked him and went to sleep. It was a really hard day, but I was very excited for the next day to start school. The perfect getaway to sightseeing, partying and eating good food is for sure Barcelona! 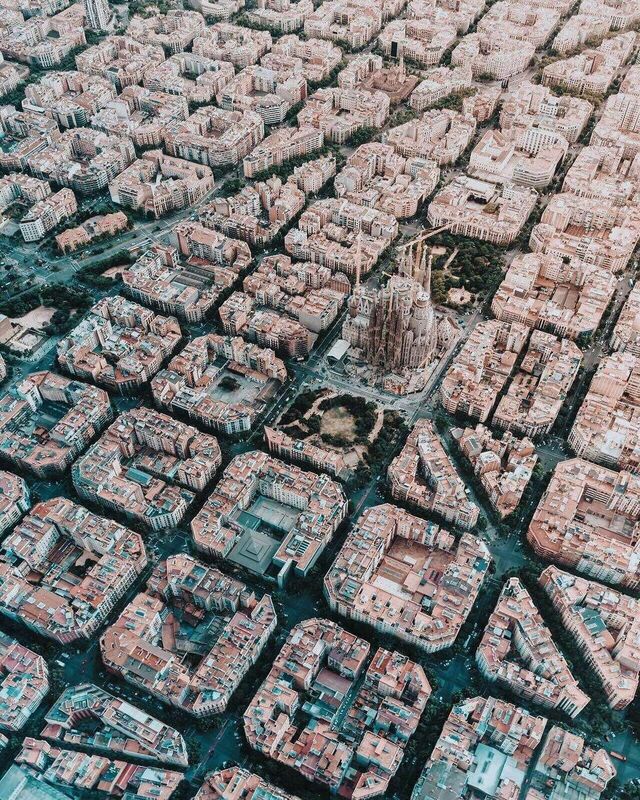 Barcelona is one of the largest metropolises on the Mediterranean Sea and it registers a little bit more than 1.5 millions inhabitants. The climate is Mediterranean which allows you to spend your entire day at the beach from May until October! But why lay the whole day there when you could discover all the deep Catalonian culture just by strolling on the streets? Of course, everyone has already heard about La Rambla street and La Barceloneta Beach because those sites are the most well-known, but continue scrolling down this article to discover hidden little places that any other travel guide won’t show you! Where to eat when in Barcelona ? There’s nothing like a good brunch to start your day off right. If you’re looking for a delicious and healthy brunch, The Tropico is your place. The interior has a beachy vibe and it has a cool atmosphere. Take a tapas break on the steps of the Rambla at The Boquería Market, which is often described as a cathedral of the senses. You will find fresh seafood, jamon, fruits, vegetables, candies… In addition, there are dozens of tapas bars where you can stop to eat. Churrería Laietana is one of the most famous places in Barcelona that serves the real Spanish churros, “porras” which are thicker than churros, with chocolate. End your long day at the Pez Vela right on the beachfront -High quality Spanish food and tasty paella. The perfect spot to begin your Barcelona nightlife adventure. What to do when in Barcelona ? For sports passionate people, Barcelona is also one of the best European cities! FC Barcelona, better known as Barça, is one of the greatest soccer clubs of all times, full of history and with a really bright future! The Barcelona adventure would not be complete without having a glimpse inside the Camp Nou, this 99,000 seat amazing stadium. If you are lucky and ready to spend a good part of your travel budget for it, buy a ticket and immerse yourself in the Catalonian culture and attend a game! That is one of the most vibrant experiences you can ever have. La Barceloneta walkway along the beach is obviously one of the standard places to visit in Barcelona. Spending the day lying on the beach or riding a segway along the beautiful Mediterranean Sea is a must and you will absolutely enjoy it and have a lot of fun during your day, either with your family or with some friends. Not only will you find a lot of typical little restaurants, but also ice cream or fruit sellers with nothing but their little barrow full of yummy snacks. The Parc Güell is probably one of the most colorful sites in Barcelona. Having a walk inside the masterpiece of the Catalan architect Antoni Gaudi is so invigorating. All those different kinds of trees and multi-coloured mosaics add a lot of charm and character to the site. You will also enjoy a really magical view of the whole city and be able to see the bay and the sea far ahead. The Parc also houses a wide variety of wildlife and a lot of birds which is an amazing place to take unforgettable pictures! The church Sagrada Familia, designed by Antoni Gaudi, is one of the most emblematic symbols of Barcelona. After more than 100 years of construction, it is still in continuous renovation. It is for that reason that you will see many cranes spoiling the landscape… Take the time to stroll through the park which offers a breathtaking view of the monument, but also book tickets in advance on the website to skip the 3-hour long line and be able to enter quickly in this amazing and peaceful site. The sun shining through the stained-glass windows and the atmosphere is stunning. Everybody is respectful and quiet; that keeps the amazing holiness of this sacred site. If you are full of energy and the temperature is not too warm, take your courage and climb on the staircase of 400-steps to see this breathtaking view of Barcelona! Have a drink with a view at the Skybar on the rooftop of the Grand Hotel Central. With its infinity pool and the impressive view of almost the whole city, it’s no surprise that this terrace doesn’t stay empty for long. The prices are relatively cheap compared to the other rooftop bars in Barcelona. If you enjoy drinking, dancing and having a party, Port Olimpic Beach Clubs is the place to go during your vacation. Here are a string of lounge bars and nightclubs. To have a drink outside, opt for Shoko or CDLC. If you prefer just to have a drink and dance surrounded by a crazy crowd and good music, you should choose either Pacha, Opium or Catwalk. During the crowded season, it is recommended buying VIP passes in advance if you want to be sure to enter and to avoid the huge line at the same time. Chilling out at Ice Bar is also a really fun experience if you are more adventurous. This bar is completely made out of ice! You can even drink in iced glasses! Every time we have been there we had an amazing time. We visited all the places above-mentioned and we highly recommend them! At any time of the year this city has a little something more that you would never find somewhere else. Everybody is friendly with you and always ready to help. Do not panic if you are lost. Public transports are really easy to use, but you should be aware that punctuality is not always a big thing in Spain. But do not despair, your bus is in any case going to come in a few minutes… Download the application Citymapper on your phone. It is really easy to use and it gives you the precise schedules of every subway, bus or train! We hope you will enjoy your trip there! You are absolutely welcome to comment on this article to tell us what you thought about the sites we recommended, and also if you would advise other places that could be added to our travel guide! The earth was formed 4.5 billion years ago. It is the third planet from the sun. Now the number of humans living on earth average 7.5 billion. That means that 7.5 billion brains could figure out a viable solution to quit our planet before. But how can we? Elon Musk is possibly an example. Most of us have known that our sun will explode in 4.5 billion years and will destroy our planet, but there are a lot of other possibilities that could kill us that are not very well known. As you can see in this documentary, the end of our planet could happen from a nuclear holocaust, a genetically engineered disease, a resource depletion, a huge disaster caused by a physical and scientific experiment, a deadly asteroid impact, methane bursts from the seabed, the creation of a black hole by the scientists or at least a super-volcanic eruption. Elon Musk is one of the most famous entrepreneurs and engineers on this earth. 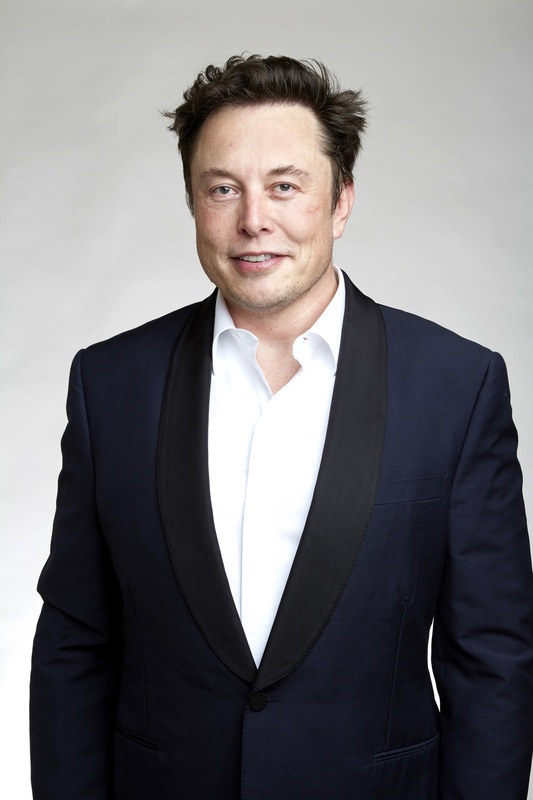 He is the founder of and very involved in SpaceX, Tesla Inc, Neuralink, the Boring Company, OpenAI and Paypal. He definitely has no limits. This man is motivated by goals in his life. He wishes to establish a human colony on Mars in order to reduce the risk of the human extinction. Also, he is trying to fight against the global warming through sustainable energy production. At least this man understood the human mission which is to keep humanity alive. Elon Musk not only has dreams, he is also a businessman. Why is he so famous nowadays? Elon Musk knows how create value and how to invest each dollar earned again into another company. He creates business value cycles in order to reach his goals. He is a great example to follow. LeBron James is one of the most famous basketball players in the world. He is 34 years old and born in Akron, Ohio. He has played for the Los Angeles Lakers since 2018. In the beginning of his career, he played for the Cleveland Cavaliers, from 2003 to 2010, winning in 2008 the scoring title and nominated into the All-NBA first Team twelve times. On November 14 of 2018, he scored 44 points in one match. This is the fifth highest scoring in the history of basketball. He also had one of the best averages of scoring in basketball. These are many facts, but what is the secret behind his big career? His early life was not really easy. He and his family moved from apartment to apartment. A football coach gave James the option to play basketball when he was 9 years old. His parents realized that James didn’t want to be a normal player – he wanted to be better than the others. With an amateur team, James and his friends, enjoyed a local and national level. Then they went to a high school in Ohio. His first season was unbelievable; James had an averaged of 25.2 points per game. Many scouts watche d him because everyone knew he could be a star. James was named the “Ohio Mr. Basketball”. He and his team were the only high school team in Ohio that finished a season undefeated. After a good college career, he joined the Cleveland Cavaliers in 2003. He was the best Rookie in this year. He played in Cleveland for 7 years, but, after failing to win a championship with Cleveland, he left them and joined the Miami Heats as a free agent. With Miami he won two NBA championships. Since 2018 he has played for the LA Lakers. All in all Lebron is not only a basketball player, he is a big influencer, an idol, and a great person. He changed the game of basketball in the way the game is played. As a person, he is one of the best leaders for a team. He isn’t a player who is just the symbol of a club. He manages to bring along and improve his teammates. I love to travel. I have traveled quite a bit already and I want to travel even more. I know that a lot of people like to travel as well. When I travel, I often think of the question, why do we travel? What’s the reason for us to get out of the environment we’re used to and where we feel safe? I found a whole bunch of answers to this question. Of course, it’s a question to which there is no right or wrong answer, but I found 5 reasons that I think are the best. #1. We travel to learn. Whether it’s learning a new language or learning about a country’s history, traveling allows us to learn so many different things. We get to learn about the diverse cultures and ways of living. We learn about how our lives are intertwined and how we can impact one another. Traveling gives us a momentary break from our daily routines and everyday lives. It provides us with adventure and excitement. When we travel and experience a new space or environment, we’re intrigued by all the new and different things that surrounds us. We forget about our jobs, our classes, and all our other responsibilities. This goes hand in hand with the previous point, but traveling allow us to discover, whether it’s an interesting location or a new favorite dish. We travel to not only see more of the world and the people in it, but to also discover more about ourselves in the process. Through the challenges that we face and the experiences that we gain, we discover our strengths, our limitations, and our potential while traveling. #4. To make new friends. 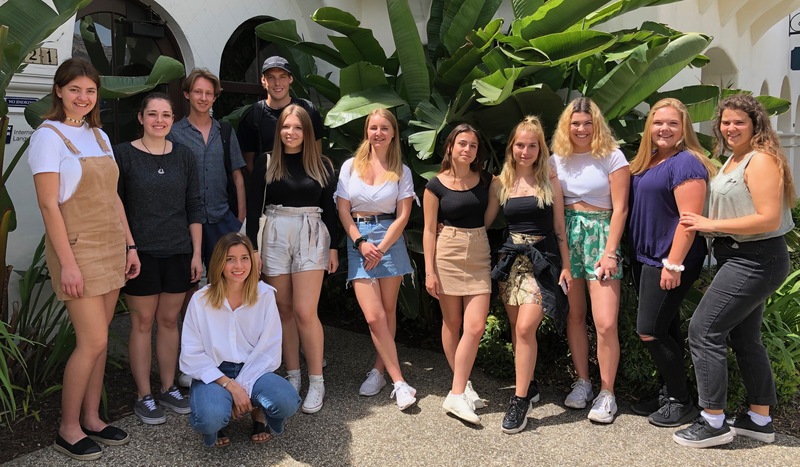 When you travel, you meet people of diverse backgrounds and experiences and every single one of them has the potential to play an important role in your life, whether that is a new best friend or your soul mate, who knows. Last but not least. We travel to experience all that we can and all that the world has to offer. We can experience the local culture by eating delicacies and dishes that are unique to the country or a certain region. We can experience what it’s like to communicate solely through gestures when we don’t know how to speak a language. We might even realize how life in a foreign country is not that much different from our own back home. Experiences help bring meaning to our lives. They both shape and define us. These were the reasons I found the best and most relatable. If you have a different answer to why we travel or a point of view then please write it in the comments. Should Journalists Be More Pedagogical ? A person who writes for newspapers, magazines or news websites or prepares news to be broadcast defines a journalist. Their works are dedicated to helping people better understand the world. However, do you think that journalists should be more pedagogical? As Einstein says “if you can’t explain it simply, you don’t understand it well enough”. First of all, I would like to share a video with you which shows geographical knowledge of random people. The question “Can you name a country?” was asked in the street. Most of them don’t know a lot about geography. It seems difficult for them to understand what’s happening in the world, especially conflicts between countries if they don’t know where these countries are located. How could some people understand an article about the Middle East conflict in Israel if they don’t know where it’s located and why there is a religious conflict ? How could people read an article about the Yemen war, or how people could understand why there is a civil war in Venezuela without geography ? Maybe journalists should be more pedagogical and add more geographic and historic details. For example in this short CBSN news, some people will not understand the video if they don’t know where North Korea is located. To understand the news clearly, the population should be also aware of the history of countries. 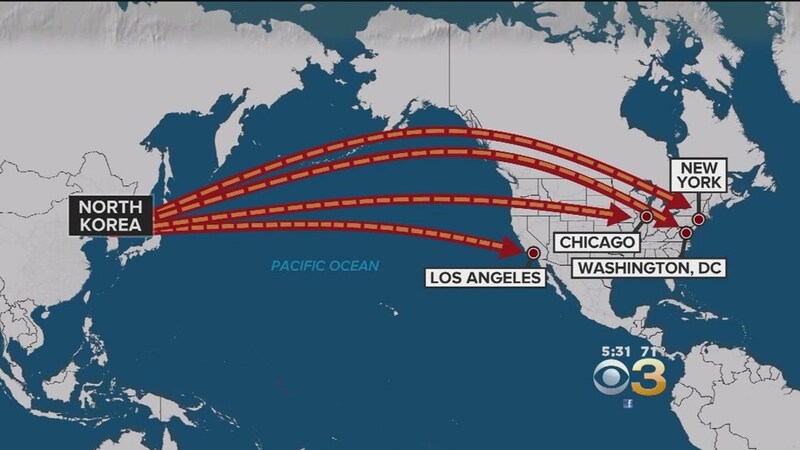 In this example, it’s important to know that North Korea is located just across from the United States (look down at the map) and that’s why a big nuclear weapon could be a threat for the US population, especially when you know that Kim Jong-un might dare to execute even his own family member. With the same idea, maybe journalists could add not only maps but also time lines. For instance, how could people understand a story easily about the Middle East conflict which started with the first global world war? Journalists should explain it easily with time facts because the history always explains why that started and why it’s continuing. Look down at this example of timeline. It is the only example that I could find online. 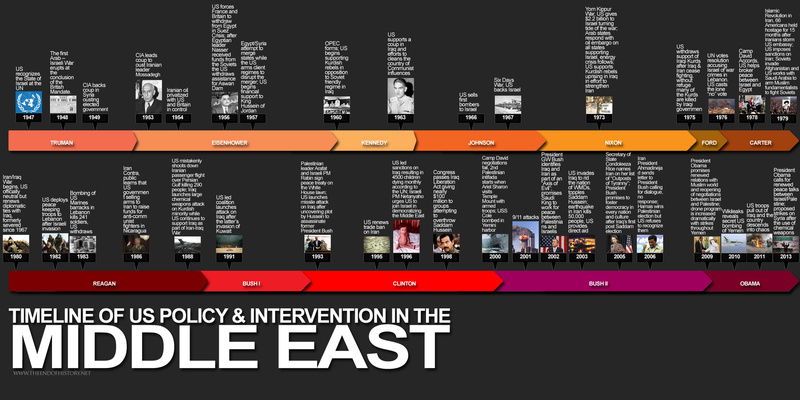 However, even this timeline which explains all facts of the US policy and interventions in the Middle East is not clear. That’s the reason why journalists should be more pedagogical. Nowadays, most of the people are discouraged to read international news. Even if 56% of the Americans are reading newspapers, some of them don’t understand news publications. Some others also can’t read at all. That could be because they don’t have access to the internet or just because they never have the chance to be at school. However, people should know how our world works if they want to vote well or change some aspects. Finally, the journalists are the only people who can impact the population’s opinions and influence people’s minds. Nowadays, journalists lose their readers because the articles and the news are not pedagogical enough. Everyone can remember the 16th June 2015, when Donald Trump won the American presidential republican election in New York. It was a big surprise ! We could have asked ourselves why the Americans voted for him at this time even if the majority of newspapers supported Hilary Clinton? Back in the days, people are used to talk together, look at each other in the eyes and share their deep emotions with relatives. Nowadays, most of our life is based on a machine. We learn through a computer, we meet through an application, we share our private lives on the internet without thinking that thousand of peoples will have access to our little private garden. As a women of 24 years old, I’m worried about the future. Technology is taking a huge space in the world and more the days pass more apps and machine are created. I write this article but I’m also a huge consumer of this technology. For example, I pass my day on Instagram, Whatsapp, Snapchat, Facebook.. for looking at the other. I consume without thinking. Thousand of contents are appearing on my feeds. I click, I like, I comment, but no emotions are felt. It’s like an automatism. We are becoming machine on a machine. The question I’m asking myself is : how much the technology is getting to change us? So many things have changed. The supermarket is getting a place where we are by our own, without any person asking us how do we feel, what are we looking for ? Because now the cashier is a machine. At school, something has also changed. We are most of the times in front of a computer.. Taping and taping without memorizing any informations. I remember the time when I had to write on a paper the lessons of the teacher. I remember coming back at home and just have to read my paper because my brain was also remembering at the same time I was writing. When was the last time you read a book? For a lot of people that seemingly simple question may turn into a really difficult one; simply because they cannot remember the last time they enjoyed a good piece of writing. Although the perks and pleasures of reading are large and great, humans these days tend to abandon books in favor of alternative amusements, such as streaming movies and TV shows. Modern devices allow people to have instant access to entertainment – we do not want to spend hours finishing a book, we want to stream a thrilling movie lasting just one and a half hours. It allows people to have instant access to knowledge – we do not want to search a lexicon when we can just find the translation or definition of a word online instantly. The traditional book is endangered, which is unfortunate, because, in fact, books have changed and continue to change the world, as few things else. There is no precise definition of what makes a book. Some might describe it as something you can read, while others might define it as pieces of paper put together. Googling the simple question ‘’what is a book?’’, you get various answers. Even though the different definitions may vary a little, they all share a few main keystones; for something to be called a book should have a written or painted work, recorded on pages sewn, glued or fixed together along one side. 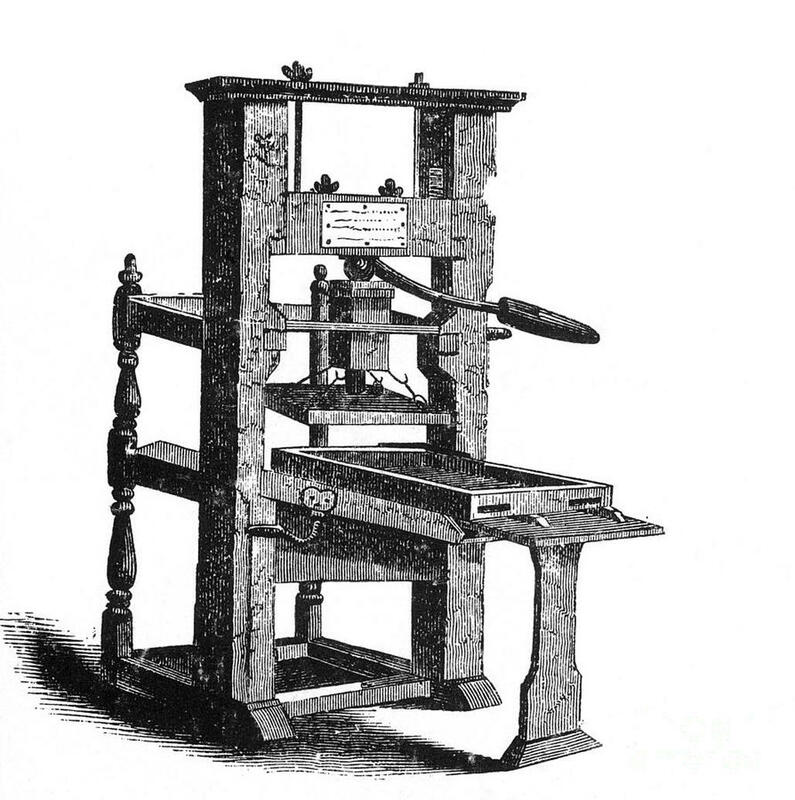 In the 15th century Johannes Gutenberg, a German craftsman and innovator, invented the printing press. This innovation was revolutionizing because it helped spread information beyond societies and borders; it enabled new ways of learning which in turn improved literacy; and last but not least, it allowed written work to be published and read not only by the ruling elite, but by everyone. Point blank: the printing press enabled books. More than five hundred years have passed since the printing press was first used. Throughout these years, decades and centuries, there are multiple examples of authors and books that have impacted the world. A prominent work is the Bible, which in fact was among the first books ever printed using Gutenberg’s invention. The Bible has impacted societies all over the world; for instance, it has influenced and helped form mores, laws, cultures and much more. Also, it has brought people together as well as given them wisdom and knowledge in a way few other works have been able to. An early edition of Uncle Tom’s Cabin (1852). An additional example of an influential and highly significant book is author Harriet Beecher Stowe’s novel Uncle Tom’s Cabin (1852). This novel was written and published in a time where the United States, which is where the plot takes place, was tainted by slavery and racism. In Uncle Tom’s Cabin, Beecher Stowe addresses these topics as she illustrates the past U.S. through a slave’s perspective. The novel came to be the best-selling book of the 19th century, and it was a precipitating factor for the start of the Civil War and the end of slavery in America. Apart from having an impact on societies and the world in general, books are also influential and important for people on a personal level. In fact, scientific studies show that reading books have a profound significance on our ability to empathize, our level of creativity, and how well we are able to learn, retain and use information. In one of The Guardian’s most-read articles from 2014, science journalist and author, Dan Hurley, discusses the relationship between intelligence and reading in his feature article ‘’Can reading make you smarter?’’. Hurley talks about his own development as a child, from being called a ‘’slow learner’’ who could not read the word ‘’the’’ at the age of eight, to getting straight As just three years later after discovering the greatness of reading Super-Man and other comics. Furthermore, Hurley refers to various scientists and their studies that can help explain his impressive progress. Among other things, he also talks about three categories of intelligence, with one being fluid intelligence, the type of intelligence that enable us to solve problems and learn new things using knowledge gained in the past. Hurley not only describes how reading increases our fluid intelligence, but also how fluid intelligence improves our critical reading and reading comprehension. Consequently, they go hand in hand and together to create a favorable spiral. Science journalist and author Dan Hurley. In conclusion, when you immerse yourself in a book, you also immerse yourself into new worlds. You are given the opportunity to discover different stories of life, as well as get to know new characters, their emotions and thoughts. Reading books gives you the key to doors, behind which there are not only enjoyment and delight, but also knowledge and inspiration. As time passes by, the world changes, and so do people. How we live and choose to amuse ourselves today differs from how people chose to amuse themselves fifty years ago, the same way people fifty years from now likely will choose to entertain themselves differently. Although the traditional book may have lost its position as a stand-out and forefront source of amusement, it still influences and impacts us. What role books will play in the future is hard to tell, but from a historical point of view, considering the impact they have had throughout time, it is difficult to envisage a world without books. With technology and digitization comes new possibilities, and lately the use of reading devices and audio books have increased rapidly. Thus, maybe our ways of consuming books will change, but the new worlds and the imaginary doors will remain – ready for us to be immersed in.